After a long day of travel to Walt Disney World, you check into your hotel completely exhausted. All you want to do is plop down on the bed and catch some zzzz’s. Just as you’re about to close your eyes, you remember – You haven’t packed your backpack for the parks tomorrow! Not to worry! I’ve provided a list of park essentials to make packing efficient and easy. Not in a reading mood? Check out my video at the bottom of this post! Park Ticket: Don’t forget that golden ticket at the hotel! Yes, you can use your MagicBand to get into the parks, but it’s nice to have a hard copy if you run into issues at the turnstile. Wallet: License, cash, cards, insurance info, etc. MagicBand: Linking your My Disney Experience account to your MagicBand will give you quick access to your park ticket, room key, FastPass+ and dining reservations as its conveniently located around your wrist. You can even pay with your MagicBand! Since your MB is your room key, there is no back-up key (unless you ask for one at check-in), so make sure it’s with you before you leave! Phone: If you have a smart phone, there are two apps I recommend checking out. 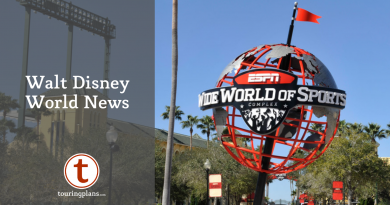 The TouringPlans Disney World Lines App helps you plan out your day at the parks with crowd calendars, wait times and customized Touring Plans. The second app is My Disney Experience which, if you have an account, holds all of your reservations, tickets and itineraries. Camera: Disney World is full of endless photo opportunities. Don’t be without a camera! Disney Swag: This is the time to pull out your Disney gear and wear it with pride! Water Bottle: Save your pennies (for the penny press) and fill up at a water fountain. Consider one with a filter (mine is a Brita) so you can fill up anywhere. Sweatshirt or Jacket: It can get down right cold at night! Make sure you bring something to keep warm. Phone Charger: If you’re a social media fan, your phone battery might be sucked dry tweeting and posting photos online. Consider bringing a portable phone charger so you don’t have to worry about needing an outlet. Snacks: As someone who is always hungry, I understand the importance of snacks. Pack some granola bars, dried fruit or even candy (hey, you’re on vacation!) to hold you over until your next meal. Stain Eraser: These are an essential in MY backpack. Can’t be without! Plastic Bags: Protect your valuables from water (Splash Mountain, I’m talking to you). Autograph Book: If character meet and greets are your thing, keep this handy for any special signatures! Pen: For your autograph book. Coins: Pressed pennies are a fun and affordable keepsake to bring home. 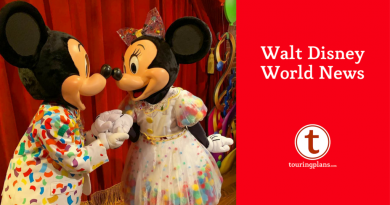 Unofficial Guide to Walt Disney World: This book is an amazing tool to utilize while planning your Disney World vacation. P.S. Use a more recent edition than my ancient 2008 version. Hidden Mickeys by Steven M. Barrett: If you’re a hidden Mickey fan, consider bringing this along to experience a magical scavenger hunt. Did I forget anything? 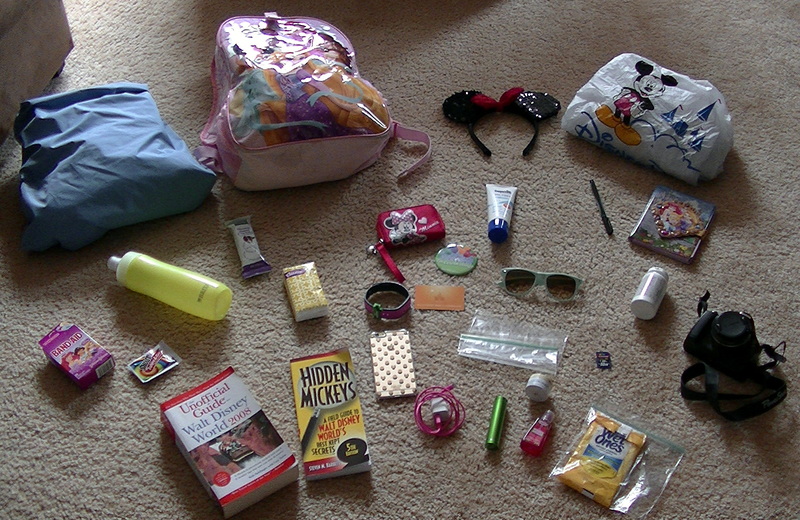 What do you put in your Disney backpack? Let me know in the comments! Bring one of thise drink flavor enhansers. Every place that has fountain drinks will give you cups of water if you ask for it. You can even ask for a large icewater! Sometimes soda gets old real fast and you want something more than just plain water. I completely agree. It’s fun to go a little crazy and have pop (soda) at every meal, but I begin to miss my usual water intake after a few days. We use the brita bottles also. They are the bomb! You can fill them anywhere that has otherwise drinkable water (fountain, free cup of water from a quick service restaurant), and never have to worry about sulfury tasting water again. The filter really does work. For something like $8.88 at WalMart, you can’t go wrong. We typically wear waist packs when in the park. I found some holsters on eBay into which a brita bottle fits perfectly. Robin was skeptical about having the bottle on her waist all day, but by the end of the first day she was a convert! A fellow Brita bottle lover! They’re just the greatest, aren’t they?! The first aid centers at each theme park will give you a dose or two of over- the-counter medications, such as Excedrin or ibuprofen or cold remedies. They won’t stock you up, but it’s a good way to get some (free) temporary relief until you can get to your own supply or get to a store and buy them cheaply. There is NO WAY I would carry around the book version of Unofficial guide, it is huge! So much of the content is available on the Lines app. So how big a backpack do you use, and can you show it packed? There is a Disney Princess back pack (shown at the beginning of the article) that I stuff to the brim. In the event that doesn’t cut it (like if it’s doubling as a diaper bag), I’ll use my husbands old college back pack. I would show it packed, but I just moved last Saturday and it’s all in boxes! Your list was pretty much identical to mine with a couple small exceptions. I agree with bringing the flavored drops to add to my free ice waters- makes that Florida water taste downright yummy! And, I also would never purposely carry BOOKS in my backpack; the darn thing is heavy enough as it is. Autograph book and pen is where I draw the line. Great article though! I really need to try these flavored drops. Which ones do you use? I buy the drops depending on available flavors. I like the Crystal Light strawberry lemonade and my kids like the Minute Maid Fruit Punch. When we buy meals, I ask for ice water, add the drops, and we can enjoy free soft drinks. With a family of four, the savings really adds up. My kids are also young enough that we can split adult quick service meals. Of course, it means pizza, nuggets and burgers for us, but it’s worth it and my kids waste a lot of food otherwise. Great list! A couple things on mine that weren’t on yours. Dramamine for people in our group who needed it before certain rides. If expecting long line days, we brought reading materials for the kids to keep them busy in line. Printed out version of touring plan, just in case. And some days we also brought crocs, for those wet activities. Finally, I brought a ziploc to keep cell phone and other things dry on very wet rides. Yes, I have a very big backpack. We’re backpack buddies! I’m one of those people who always needs to be over prepared – just in case! Reading material is a great idea for long lines. I always bring a change of clothes for my daughter as well. You just never know. You mention park ticket. Can we get one of those? We have MagicBands. What’s the likelihood of them not working (or losing them)? Looks like you have a clip on yours. I also include ear plugs for my daughter. Some of the loud shows bother her. We’ll be taking bug spray too. When you buy your ticket, it should come in the form of a credit card-type card. 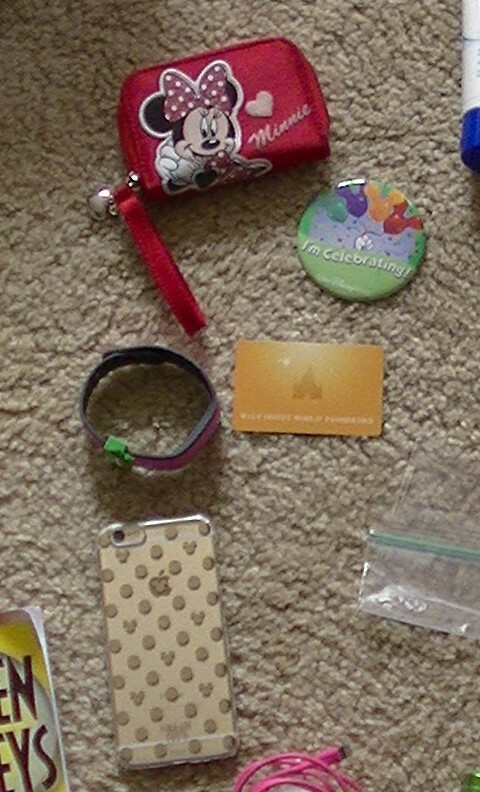 You can use this to get in to the parks or you can use you MagicBand. There’s a number code on the back that can be entered in and linked to your My Disney Experience account. I’ve used my MagicBand as my ticket my past three trips to WDW and have never had a problem. My clip is a decal I got when I became an annual pass holder. I bring ear protection for my daughter as well. Those fire works are so loud! For folks with kids: Glow sticks/bracelets, necklaces for evening parades. O2 Cool mini keychain fans (Walmart for $1.88) and travel-size spritzer bottle for water for those hot afternoon parades. Plus some kid-friendly snacks like goldfish, fruit snacks, rice krispie treats, trail mix. I also carry 8 oz bottles of water for the morning, so we can make the most of the morning hours without having to stop for concession water. Love the list. You can never have enough snacks! Thanks, Angela, for a great list. Our list is about the same. Those moleskins especially have been handy over the years. One thing we’ve changed recently is getting ice water from counter service places, after depleting a few random water bottles we bring. I was pleasantly surprised how good the water now is at those locations. Have tried the bubblers previous years, no thanks haha. And was great to rest up in some a/c while rest of fam went on one of the rides. One change I’ll make next trip, to bring extra pair of reading glasses (those cheapy ones work fine)- lost mine early last trip, and didn’t want to pay top dollar for glasses at Disney stores. Got by ok since only need them when contacts in, but had to use rest of fam’s eyes for small print moments!